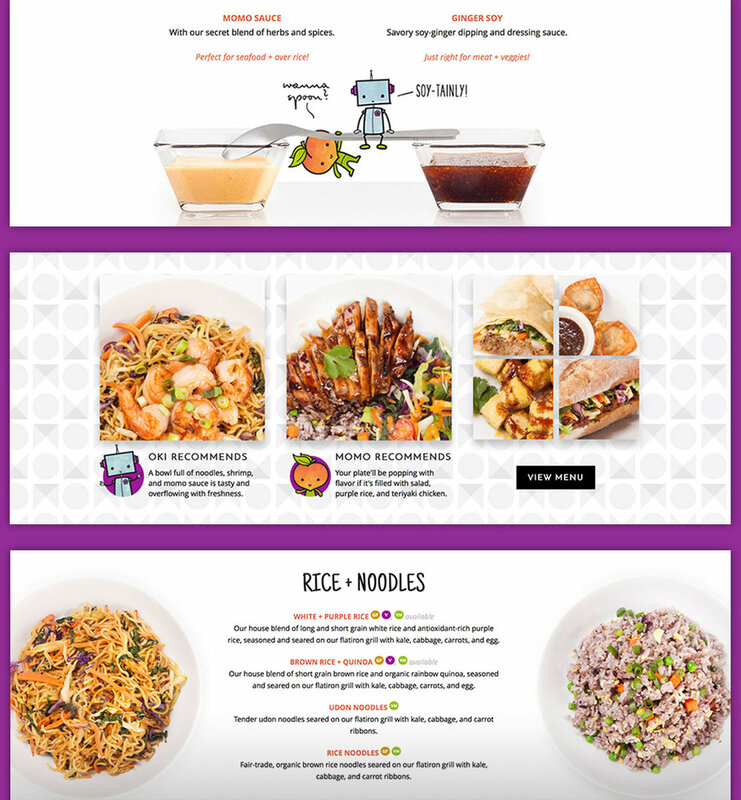 Introduce a new fast-casual Asian restaurant concept into an oversaturated market. Overcome the idea that organic/healthy doesn’t have to mean boring. Create an engaging brand that has a connection to Asian culture without succumbing to clichés. 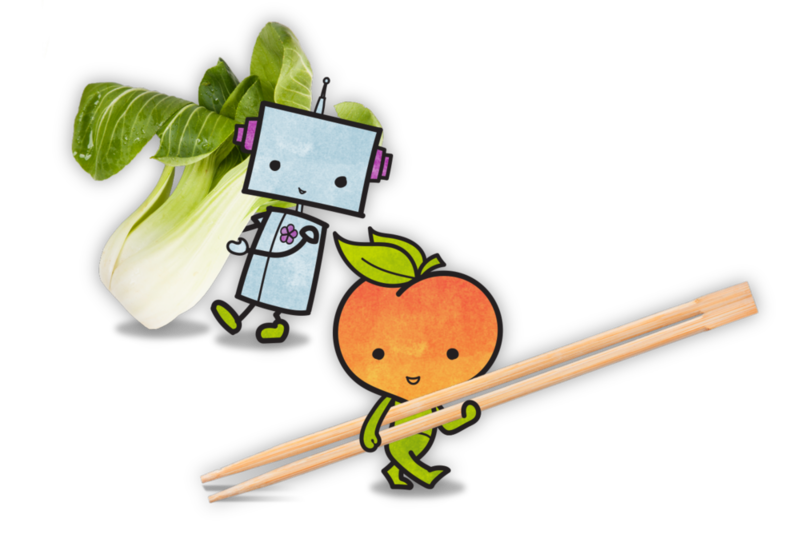 We changed the original name, Momo (meaning “peach” in Japanese), to Oki Momo (“big peach”) for better distinction amongst similar establishments, and found inspiration in everything from origami to Japanese robots to the traditional peach tree. We created an origami-inspired logotype that constantly walks the line between traditional and modern, Asian and American, bold and delicate, structured and handmade. Characters “Oki” and “Momo” are the joy behind the geometric and the happiness in the health-conscious. Their interaction with the 3D world brings them to life and brings the menu into the narrative. Packaging and store environment designed with first location budget in mind, but with a vision for expanding into a multi-unit chain. We are so happy with the design work they are doing for our new restaurant, Oki Momo Asian Grill. From the logo and branding, to their marketing strategy tips, to the signage, and the website–they do it all and they do it so well. I highly recommend them! Easy-to-use Content Management System (CMS) allows offerings or prices to adjust at any time. Extensive, uniquely structured menu is well organized. Color-coded icon system notes dietary requirements. Easily accessible contact info, hours, and directions. Embed on any page—including the homepage—to keep location info front and center for the customer. Custom markers to capture playfulness of the brand. Custom styling to compliment the brand color palette. Expansion! Ready to note additional locations as Oki Momo franchises. Customers say they keep coming back because they love spending time in the atmosphere at Oki Momo. People universally praise your design work and we field at least a dozen or so inquiries a day as to whether or not we are a chain. Personality-packed branding connects with customers and sets the stage for interaction. Extending the charm into the physical space invites customers to stay & keep coming back. Planning for expansion from the start leaves Oki Momo well-positioned for multiple units. A little bit of charm goes a long way. A joyful approach can make big waves.